“In general, we have shown that we are not quite as unique as we once thought. Our solar system closely resembles other observable planetary systems within our galaxy. 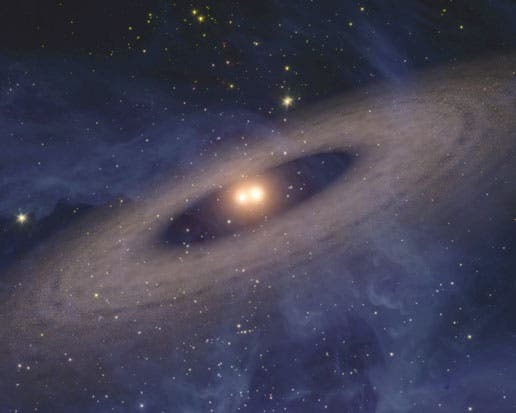 In this way, our results serve to corroborate other research results which indicate that earth-like planets are more widespread in the universe than previously believed,” says Professor Martin Bizzarro, head of the Centre for Star and Planet Formation at University of Copenhagen. Some 4.567 billion years ago, our solar system’s planets formed from an expansive disc of gas and dust rotating around the sun. While similar processes have been observed in younger solar systems throughout the Milky Way, the formative stages of our own solar system were believed to have taken twice as long to occur. New research led by the team at the Centre for Star and Planet Formation shows that our solar system is not quite as special as once believed. Using improved methods of analysis of uranium and lead isotopes, the current study of primitive meteorites has enabled researchers to date the formation of two very different types of materials, so-called calcium-aluminum-rich inclusions (or CAI’s for short) and chondrules, found within the same meteorite. By doing so, the chronology and therefore overall understanding of our solar system’s development has been altered. The study has just been published in the scientific journal, Science. The researchers took a closer look at the first three million years of the solar system’s development by analysing primitive meteorites composed of a blend of our solar system’s very oldest materials. In part, the study confirmed previous analyses demonstrating that CAI’s were formed during a very short period of time. The new discovery is that the so-called chondrules were formed during the first three million years of the solar system’s development as well. This stands in contrast with previous assumptions asserting that chondrules only started forming roughly two million years after CAIs. “By using this process to date the formation of these two very different types of materials found in the same meteorite, we are not only able to alter the chronology of our solar system’s historical development, we are able to paint a new picture of our solar system’s development, which is very much like the picture that other researchers have observed in other planetary systems,” says James Connelly of the Centre for Star and Planet Formation. *Showing that chondrules are as old as CAIs addresses a long-standing question of why chondrule formation should be delayed by up to 2 million years after CAIs. The answer – it is not. The NASA artist's concept at top of the page shows a faraway solar system like our own — except for one big difference. Planets and asteroids circle around not one, but two suns. NASA's Spitzer Space Telescope found evidence that such solar systems might be common in the universe.